Having the right coach can make all the difference when it comes to maximizing your training for an upcoming competition. In order to ensure Sphinx Elite offers the best coaching service for you, we meet with all of our clients prior to the beginning of any training plan, and ensure that your needs are met through our tried and true training philosophy. Dennis’ coaching experience stems from his days at Penn State where he ran under one of the all-time great coaches in American distance running history, Harry Groves, and after coach Groves retired in 2006, under Beth Alford-Sullivan, an olympic coach at the 2004 Athens games. The experience gained by training under the contrasting styles of these two world-renowned coaches allowed Dennis to create his own unique training philosophy, tailored to each athlete’s individual needs, that stresses quality over quantity. Dennis also spent time as a Volunteer Assistant Coach at SUNY Buffalo before moving to Tucson, Arizona to pursue a doctoral degree in Physiology (and escape the bitter winters of Buffalo, NY). He also holds a degree in Nutrition from Penn State, a Masters Degree in Exercise Physiology from SUNY Buffalo and is a Registered Dietitian, specializing in sports nutrition. In the past, Dennis has worked closely with the athletic departments of Penn State and SUNY Buffalo to provide sports nutrition consultations to their Division I varsity athletes. As a coach and sports dietitian, Dennis has helped his athletes reach the finish line of their first marathon, achieve podium finishes in elite races and competitions, and set big personal records while at the same time enjoying the process. Dennis recently set a NEW WORLD RECORD as part of a 1,000 mile relay run from the University of Minnesota to Penn State University with 9 other elite athletes. The relay began on Monday, August 27th and raised money towards a scholarship fund created by the Kevin Dare Foundation, a non-profit organization dedicated to advancing pole-vault safety. As a post-collegiate runner, Dennis has set personal bests in every event from the 1500m to the half-marathon. He finished 7th in the 2011 Los Angeles Rock ‘n’ Roll Half Marathon, his half marathon debut. He also has three top 5 finishes in the prestigious Penn Relays Olympic Development 5k in the past three years, and has won the annual Buffalo, NY Turkey Trot for the past four years in a row, an event that has averaged over 11,000 finishers each year during that time frame. During his time at Penn State from, 2005-2009, Dennis finished 8th in the highly competitive BigTen conference championships 5k twice and anchored the indoor DMR to a 5th place showing in his senior season. 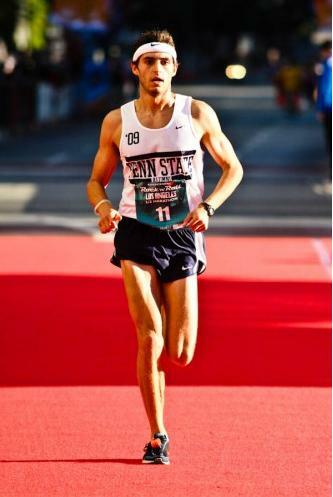 He was also a member of Penn State’s Top 25 cross country team in 2008.